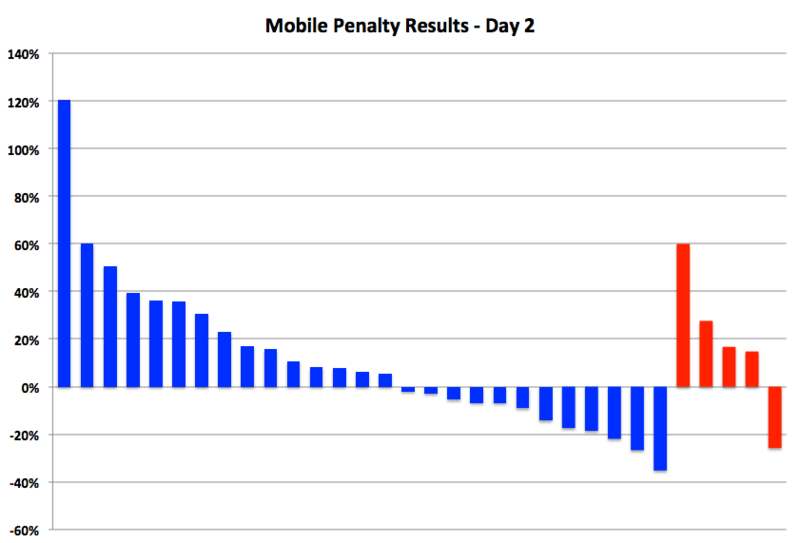 The 12 non mobile friendly sites have seen traffic up 32%. Explanation please? We sometimes see these upward spikes at the early stage of an algo change OR (more likely) a few outliers are having an inordinate impact on a small data set – stay tuned. OR (and i’m believing this last explanation to be true) the algo is either rolling out very slowly or the impact of the change is going to be much less than telegraphed. In the graph below – blue bars are mobile friendly, red are not – and this represents a sample of the more trafficked sites in the study.